The Reserve at Newcastle Bldg. Listing courtesy of Realogics Sotheby's Int'l Rlty. Listing courtesy of Windermere Real Estate/PSR Inc. Listing courtesy of John L. Scott - KMS Renton. Listing courtesy of Kersten Associates. Listing courtesy of The Cascade Team. Rainer Crest Division 1 Bldg. Courtesy of Executive Real Estate, Inc. Listing courtesy of Executive Real Estate, Inc.. Listing courtesy of Rainmakers RE Services LLC. Listing courtesy of Quadrant Real Estate LLC. Lake Washington Ridge Div No 2 Bldg. Hillmans LK WN Garden of Eden #3 Bldg. Courtesy of Windermere RE/South, Inc. Listing courtesy of Windermere RE/South, Inc.. Courtesy of WPI Real Estate Services, Inc. Listing courtesy of WPI Real Estate Services, Inc..
Hillmans Lake Washington Garden of Eden Bldg. Courtesy of RE/MAX Eastside Brokers, Inc. Courtesy of RE/MAX Metro Realty, Inc. Listing courtesy of Ara Realty. Listing courtesy of Key Homesellers. Rainier Crest - China Creek Bldg. 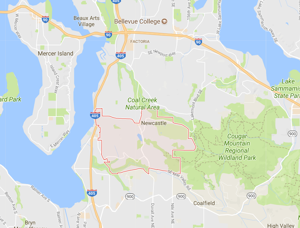 Newcastle is a city in the Eastside region of the Puget Sound area, located to the east and south of Downtown Seattle. It is an upscale community that only counts around 10,000 residents, although it has been growing in recent years. The prime location of this city adjacent to the I-405 freeway makes it popular with those who work in Seattle, as well as Eastside locations like Bellevue and Redmond. A quick look at the MLS listings in Newcastle will revel just how in-demand this city is. The median home value is close to $600,000, and the properties are generally a mix of single family homes and townhouses. Depending on the location of a given property, it is possible to have great views from Newcastle to the west which can include Lake Washington, Mercer Island, and Seattle itself. The most notable attraction in the city of Newcastle is the Golf Club of Newcastle, one of the premier golf facilities in the Seattle area. The golf club offers two courses which are open to the public, as well as a driving range. Additionally, the property holds countless events each year in its dining facilities. On a clear day, the view from the Golf Club at Newcastle is one of the best in the entire region, offering a panoramic vista that spans from Seattle to Bellevue and beyond. Newcastle is only a few minutes’ drive south from Bellevue, and a quick trip across the I-90 Bridge from Seattle. Of course, during commute times, these short drives can become quite a bit longer. Even considering traffic, Newcastle is a prime location because of access to I-405 and how easy it is to go in any direction. Whether heading south toward Tacoma or north to other Eastside cities, Newcastle provides wonderful access to the rest of the Puget Sound region. Given the growth in population and new housing that Newcastle has seen in recent years, it seems that this city will only continue to grow in the years to come. Due to the fact that the city is limited in size, properties that come on the market are often in high demand and may not last long on the real estate listings.